London, UK – 7th March 2017 – Kaminario, the leading all-flash storage company, today announced its participation at Cloud Expo Europe. The company is taking advantage of the event to provide European delegates with one of the first opportunities to experience its newest generation of all-flash storage for running successful SaaS and cloud-based businesses. Kaminario will be exhibiting on stand 810. Cloud Expo is Europe’s largest, best attended and multi award-winning cloud and digital transformation show. In 2016 its record-breaking audience was made up of 18,515 total attendees (BPA audited) senior decision makers. Cloud Expo Europe features a major exhibition with a record 600+ cutting edge suppliers. Tom O’Neill, Kaminario’s CTO International, will talk about the urgent requirement for the most scalable storage platform to enable cloud businesses to grow rapidly without adding complexity. To that end, Kaminario set itself a challenge: how to create a cloud storage platform which can scale without adding complexity. The answer, it believes, is to make storage application-aware. At the event Kaminario will be demonstrating its sixth generation (Gen6) of its K2 all-flash array delivering multi-petabyte scale storage. The newer generation of the all-flash array delivers up to five times more capacity than the previous generation and twice as much performance. The array can linearly grow the number of CPU cores and independently grow solid-state capacity. Kaminario, the leading all-flash storage company, is redefining the future of modern datacenters. Its unique solution enables organizations to succeed in today’s on-demand world and prepares them to seamlessly handle tomorrow’s innovations. Only Kaminario K2 all-flash array delivers the agility, scalability, performance and economics a datacenter requires to deal with today’s cloud-first, dynamic world and provide real-time data access – anywhere, anytime. 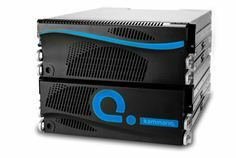 Hundreds of customers rely on Kaminario K2 to power their mission critical applications and safeguard their digital ecosystem. Headquartered in Needham, MA, Kaminario works with an extensive network of resellers and distributors, globally. For more information, please visit www.kaminario.com.